1. Preheat your oven to 185 degrees celsius and season the chicken thighs with salt and pepper. 2. Heat the rapeseed oil in a roasting pan set over two burners at medium high heat. 3. Sear the chicken skin-side down in the roasting pan. After the chicken thighs have been searing for about 5-7 minutes, flip them over. 4. Add the potatoes and stir them in the oil. Add the lemon slices and garlic cloves, tossing everything together so the potatoes and garlic are well-coated in rapeseed oil. 5. 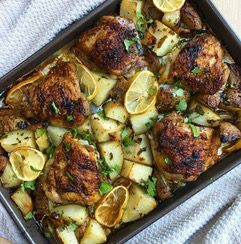 Transfer the chicken to the oven and cook for another 30 minutes, or until the chicken is cooked through and the potatoes are tender. Remove from the oven and stir in the herbs & the Brussels sprouts leaves for garnish.